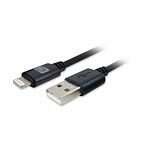 Designed with a large Pro Grade 26 gauge center conductor and an advanced molded strain-relief, Comprehensive's Pro AV/IT Lightning to USB cables are built to last. Another Comprehensive exclusive feature is SureLength indicators which tell you the length of the cable right on connector head. Simple but convenient, especially for integrators and installers. A extra-flexible matte jacket makes the cable easy to use and minimizes stress. Comprehensive's Lifetime Warranty comes standard.